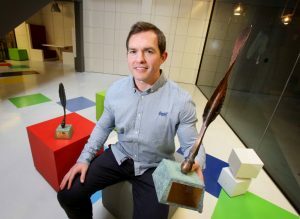 A 35 year old former Connacht Rugby star from Athlone was named Ireland’s Best Young Entrepreneur (IBYE) for 2018 at today’s National Final in Dublin. Conor O’Loughlin and his company Glofox took home the top award at today’s event after also winning his national category, Best Established Business, and securing a total investment fund of €40,000. Funding for the LEOs and the IBYE competition is provided by the Government of Ireland through the State Agency, Enterprise Ireland. The programme, which is run by the network of Local Enterprise Offices (LEOs) nationwide and supported by the Department of Business, Enterprise and Innovation and Enterprise Ireland, attracted over 1,400 applicants in 2018 with an investment fund of €2million. Already through the programme this year, 185 entrants have secured investments of between €3,000 and €15,000. Minister for Trade, Employment, Business, EU Digital Single Market and Data Protection, Pat Breen T.D., made the announcement in front of 360 guests at the IBYE National Final, held at Google’s European Headquarters in Dublin today. O’Loughlin, representing Local Enterprise Office Dun Laoghaire Rathdown, played 97 times for Connacht, including a Challenge Cup Final against Harlequins and appearances for Ireland ‘A’ and U-21, before retiring at 28 due to a hip injury. The former scrum half went on to set up Glofox, a gym management software system, in 2014. The business, which allows both gym members and gym owners to access usage, payment and service information, now has over 1,000 customers spread across 23 countries. O’Loughlin is in the process of setting up a base out of New York in 2018 with the United States the company’s main focus. 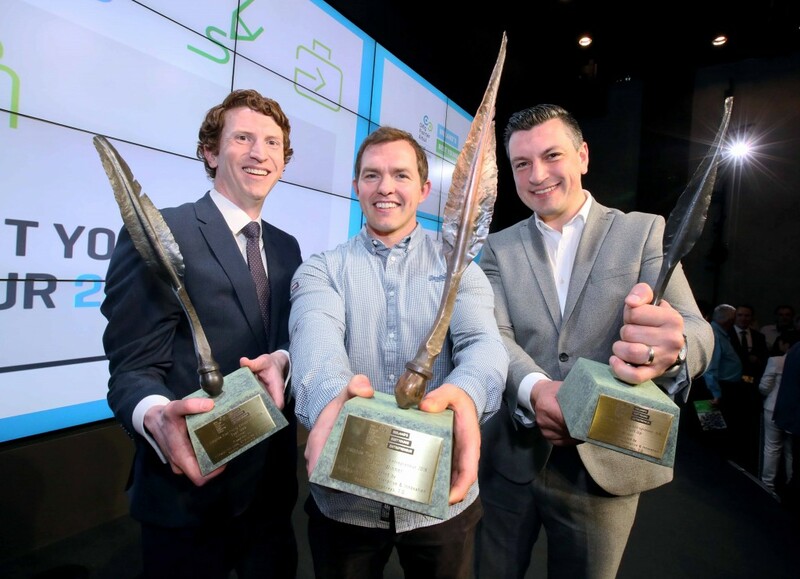 The other IBYE National Final category winners were Brendan Boland of Loci Orthopaedics representing Local Enterprise Office Galway who won Best Business Idea and Alan Hickey of WeBringg representing Local Enterprise Office Fingal who won Best Start-Up Business. The runners-up in each of the categories were Joe Perrott of Remote Signals and Kevin Kelleher of Ostoform in the Best Business Idea category with both securing a €4,000 investment fund. In the Best Start-Up Business the runners up were Ciaran Gorman of BevCraft and Jessica Kavanagh of Olann who both secured a €5,000 investment fund. In the Best Established Business the runners up were Paddy Finn of Electricity Exchange and Robbie Skuse of Kollect.ie. They will both receive an investment fund of €5,000. The winner of the Google Award for Best Online Promotion of a Business Award went to Matthew McCann and Access Earth. He receives €1,000 worth of Google Ad Words Credit and 13 weeks in a Google mentoring programme. Minster for Business, Enterprise and Innovation, Heather Humphreys, T.D., said; “Congratulations to the winner Conor O’Loughlin and to all those at the IBYE National Final. The IBYE process, which is delivered by our network of Local Enterprise Offices, is not simply about creating award-winners; it’s about giving entrepreneurs the tools they need to bring their ideas to life and, ultimately, create sustainable jobs. The success of the competition has clearly demonstrated the appetite for young Irish people to start their own business. “The facts speak for themselves: including this year’s applicants, over 5,700 18-35 year old’s have applied for funding to develop their business ideas over the past four years. Research now shows that the €5m the Government has invested in IBYE between 2014 – 2016 has supported over 2,200 jobs and generated €124m in sales. Sheelagh Daly, Chair of the Network of Local Enterprise Offices, said; “Congratulations to Conor O’Loughlin and all today’s winners. The network of Local Enterprise Offices have been working closely with the hundreds of participants in IBYE throughout the year and today is a proud day for all the LEOs who supported and mentored these finalists right through the competition. While this is a great day for the national winners and the finalists here today, all of the 185 IBYE local winners can be very proud of what they have achieved this year. 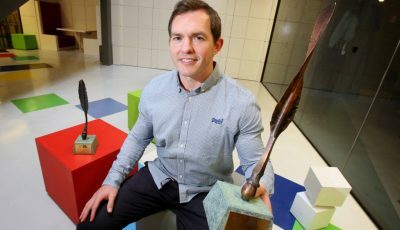 The judging panel for this year’s Ireland’s Best Young Entrepreneur was chaired by Paddy Flynn, Director of Trust and Safety, Google. The other members of the panel were Eugene Forde, Department of Business, Enterprise and Innovation, Joe Healy, Enterprise Ireland, Rita Guinan, LEO Tipperary, Brian Crowley, CEO of TTM Healthcare and Sarah Doyle, CEO of Kinesense, while broadcaster Claire Byrne was the Awards host. The Ireland’s Best Young Entrepreneur (IBYE) programme has been running since 2014. Research commissioned by Enterprise Ireland for IBYE 2014 – 2016 Report, found that the 348 entrepreneurs, funded by the programme are currently generating annual revenue of €124million. The research also highlighted that they are employing over 2,200 people. In addition, 1,350 entrepreneurs received business bootcamp training and one to one mentoring. Conor O’Loughlin established Glofox in 2014 and has grown the business steadlly since. The Galway native received assistance from Local Enterprise Office Dun Laoghaire Rathdown and are now a client of Enterprise Ireland’s High Performance Start-Up Unit (HPSU). Glofox is gym performance management software that allows both members and trainers to access key information such as payments, service information and booking, and attendance. O’Loughlin retired from Connacht Rugby at 28 following a hip injury. He played 97 times for the province including a Challenge Cup Final against Harlequins and also represented Ireland at ‘A’ and U-21 level. The Athlone native now oversees the company that has over 1,000 customers in 23 countries growing from 300 at this point in 2017. In 2018 they have established an office in New York with 60% of their install base now in the United States. Kildare native Brendan Boland, who is representing Local Enterprise Office Galway, graduated from UCD medicine in 2006 before going on to practice medicine for 6 years after which he went on to undertook a Masters in Medical Device Innovation. Through this he identified the unmet clinical need of treatment of thumb base joint arthiritis. He went on to develop the InDx implant which accommodates the natural movement of the joint and results in an improved functional outcome with a less invasive surgery. With over 40million in the US & EU having significant symptoms, the thumb base arthritis procedures market is estimated at €600million per annum. Boland only sees this growing with increased thumb usage through mobile phones every day. Alan Hickey, representing Local Enterprise Office Fingal, set up WeBringg in 2015 to address a need in the market for quicker deliveries of consumer goods purchased online. The technology is aimed at revolutionising E-Commerce. Hickey’s WeBringg utilises crowdsourcing technology to find drivers to bring deliveries the final step to their destination, when the delivery may be sitting in a warehouse waiting to be delivered as part of a group delivery. The drivers, who are not employed by WeBringg, then get a percentage of each delivery. They currently have over 4,000 drivers in their database for deliveries. They now provide a delivery service for such companies as JustEat and a handful of retailers. They have operations on Dublin, Galway, Cork, Belfast, Glasgow and Cardiff with expansion in Australia and New Zealand planned for 2018.